Fragrancenet has really good prices for Creed Royal Oud at the moment. Thread: Fragrancenet has really good prices for Creed Royal Oud at the moment. I just got an email from Fragrancenet and the prices for Royal Oud are really good. I used snipping tool to capture the email graphic of the prices for you guys. An 8.4oz flacon is just $311.49. WOW! And even their 1.7oz bottle that used to cost around $230 is selling for $153. Also, if you're a fan of the 4oz "flask" bottle style, this will be among your LAST opportunities to buy it because Creed replaced them with the 'sloped shoulder' bottle look. These are great prices for this fragrance and IMO, this is one of Creed's best scents. I don't know why Fragrancenet is selling these for so cheap, but IMO, I noticed these are the old bottle sizes, so I think Fragrancenet is trying to move their existing stock so they can put in the more expensive smaller bottle sizes. So, if you've wanted to buy Royal Oud, there really isn't a better time to get fantastic bang for your buck (bottle size vs price). Also, if you're concerned about getting a slightly older bottle, just don't worry because Creed's scents seem to smell better with age (All my Creed bottles age very well). Last edited by tspencer; 16th May 2018 at 10:17 PM. Re: Fragrancenet has really good prices for Creed Royal Oud at the moment. Good prices for those who don't have it yet and want it! Or if you love Royal Oud and are running out and want to ensure a long-term supply, that 8.4oz flacon for $311 is a fantastic way to go. It will last for many years to come and is a fantastic bargain when factoring price/quantity for an 'elite' fragrance like this. $211 for the 4 oz if you use the still-working 37% Google shopping method. 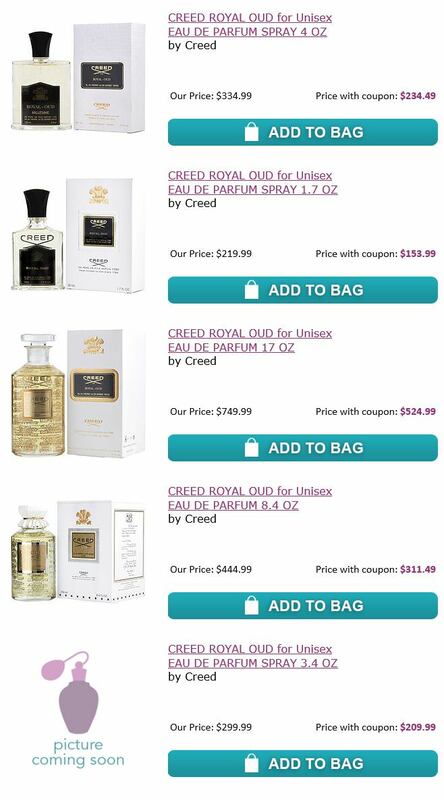 Creed Royal Oud 75 ml at good price in the U.S.